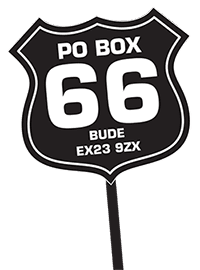 It’s not often I find myself ‘ahead of the curve’ so to speak, certainly not in the classic motorcycle world but this time I think that I might just be there. 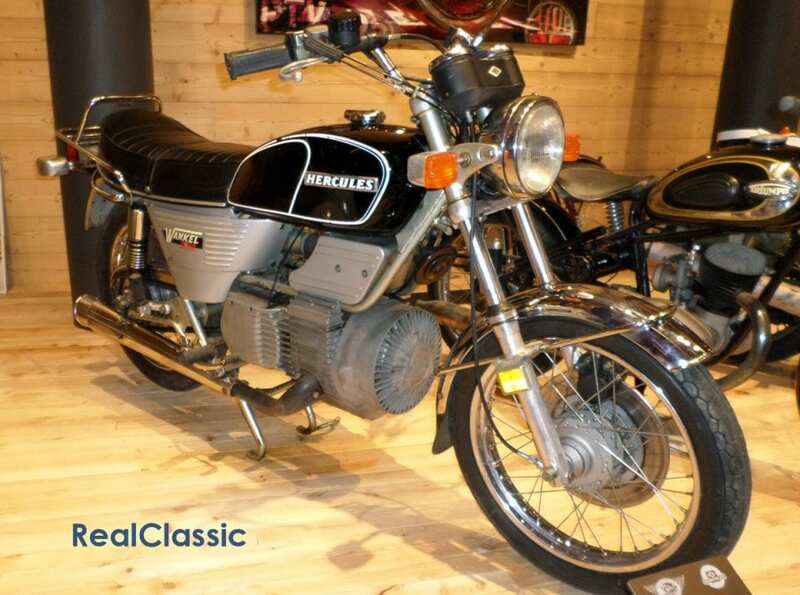 As well as fettling old motorcycles, one of my favourite motorcycle-related pastimes is to get one of my old nails out of the shed and ride it into the Alps to find some of the best alpine passes to negotiate. On my trips I try to follow the sage advice of the old comedian Spike Milligan. ‘If you don’t plan anything, then nothing can go wrong.’ I have a general aim of riding to the Alps and just see what happens on the way. I even leave the booking of a channel tunnel slot until a day or two beforehand, and I don’t book the return trip until I’m about a day or so from a channel port. I find hotels en route and stop where and when it suits. Serendipity often describes the events I experience on these trips. It’s a lovely word and over the years I’ve had some truly serendipitous moments on my tours. However, I think I’ll have to go some to surpass this year’s discovery. On this trip I had the pleasure and honour to travel with my son Tom, riding his bike, on his first continental motorcycle tour. We made our way across Belgium, the northern part of the Black Forest in Germany and into western Austria. We aimed ourselves towards the Dolomites in Italy and decided to ride the Timmelsjoch / Passo Rombo alpine pass into Italy only the evening beforehand. According to the map there was a route. My satnav, ‘Satan’, suggested that it was a no-through route. We decided to continue on, as it looked like a road full of hairpin bends. As we got close to the top I noticed the first indication of the find ahead; a tourist sign for a motor museum. At the top of the pass, at 2509 metres, was a very modern, almost space-age-looking building, housing a cable car station, a restaurant and the road toll booths. (I’d overlooked that I had set ‘no toll roads’ hence ‘Satan’s’ closed road reading). 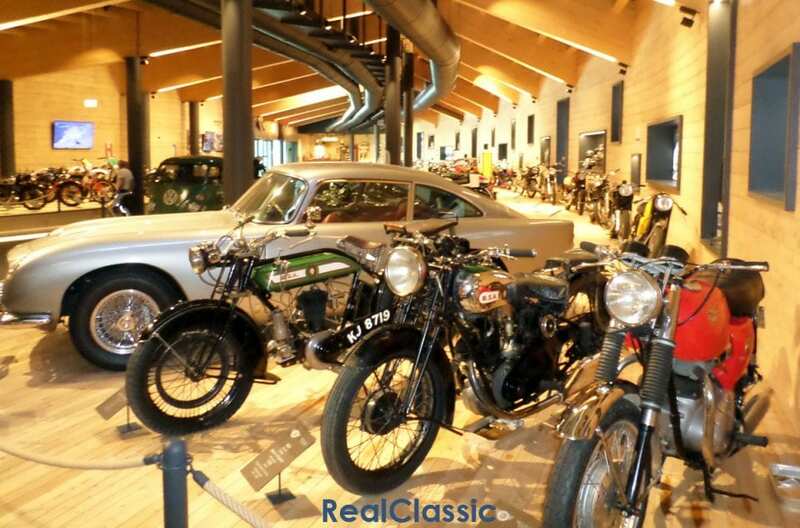 The feature of greatest interest to RealClassic readers was the Top Mountain Motorcycle Museum which had opened in April this year. 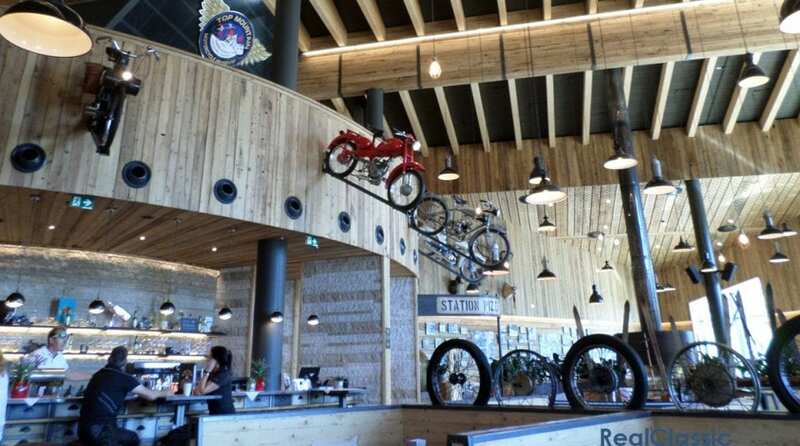 After a nice meal in the themed restaurant which is suitably decorated with lightweight machines hanging on the walls, and bits of old motorcycle parts scattered around the booths, we moved on into the museum. The entry fee was €10, so not too offensive, and we entered a room containing a selection of about 30 machines the majority being combinations. Amongst the machines was a well presented Triumph combination with the sleekest, whitest, boat-like chair that I’ve seen. There was a really nice looking 1917 Excelsior with patina that spoke of a thousand stories throughout its near century long history. 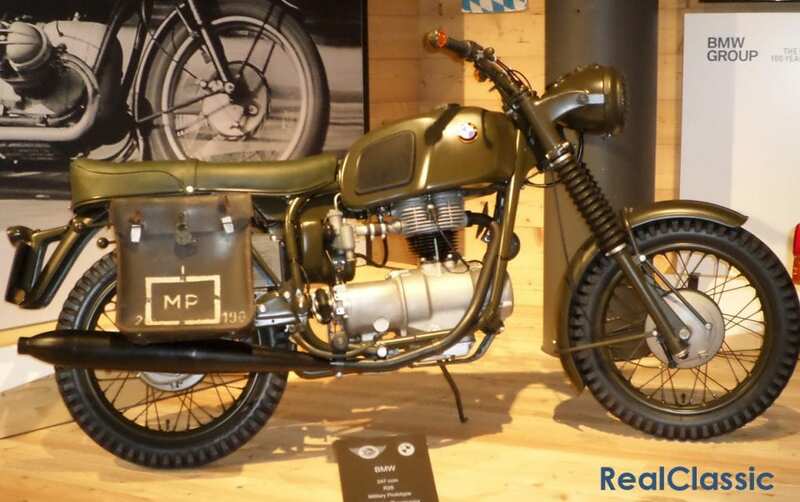 For some reason a Swiss Motosacoche combination caught my eye; perhaps, again, the patina. I really do like to see originality. After a pleasant if short while there we started to move off, believing that was it. We felt that, at €10 for just 30 bikes, the admission fee was a borderline to a rip-off price. The building encases the cable car station so we decided to walk over the top of the cable station to view the workings before leaving. It was only at the top of the stairs that we became aware of a second part of the museum. On walking through a set of doors we entered a large curving hall, over 100 metres long, containing about 140 to 150 machines. 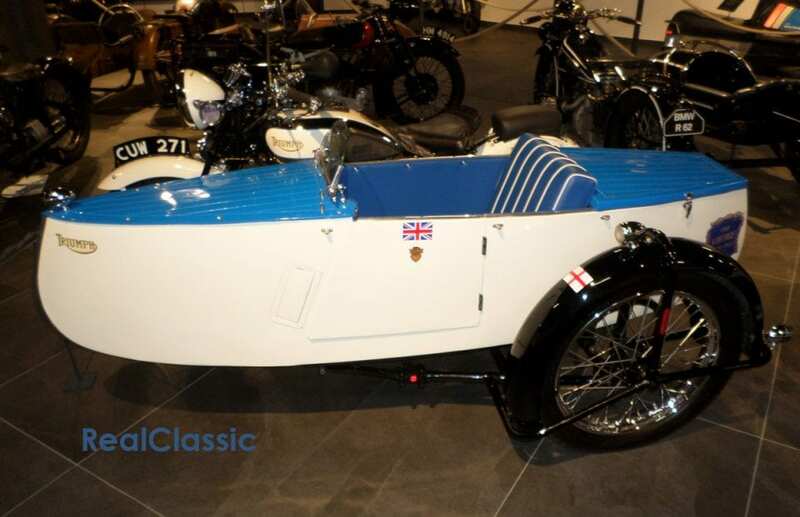 Immediately to the left of the doors stood four, very well presented Brough Superiors of various ages. One of the Broughs was a combination fitted with an Austin Seven engine which was a surprise to me. To my right, a beautiful 1923 New Imperial; in front, some very early European machines and back to the left, beyond the Broughs, a selection of BMWs. I just didn’t know where to look first. On the wall behind the Broughs was a brilliantly thought-out display of a Vespa scooter made up as if it was a full size Airfix model kit with all the parts laid out within a mock moulding sprue. Moving on through the museum I repeated comments like ‘wow, they’ve got one of those,’ ‘look at that,’ ‘isn’t that just fantastic,’ ‘you won’t see four like that together again for a while’. I was so animated about the machines on display that my son described the event as quite worrying, for a young man to see his father having a ‘bikegasm’* in public. In my defence there were four German riders of similar vintage to me sounding equally as enthusiastic about their visit. There were just so many wonderful machines. 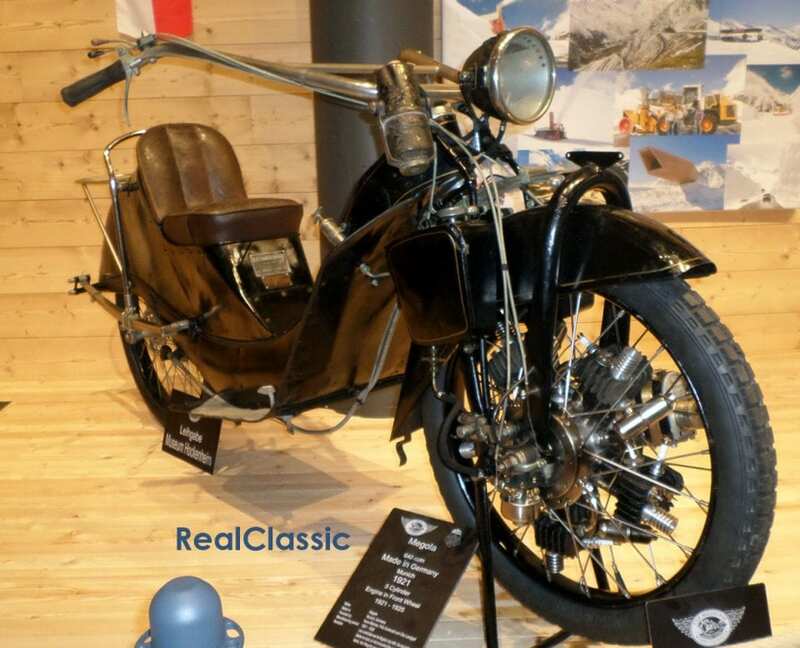 I could mention all of them but I’ll restrict myself to a few more unusual ones like the 1905 Laurin and Klement with a super little V-twin inlet over exhaust engine mounted in what was basically a large pedal cycle frame. A Megola with a five cylinder radial engine mounted within the front wheel. Apparently it does not have clutch or gears, difficult to use in town but on the track it was in its element. For Frank W’s benefit, there was even a very tidy Norton rotary. One machine that I had not seen before was a Mercury. 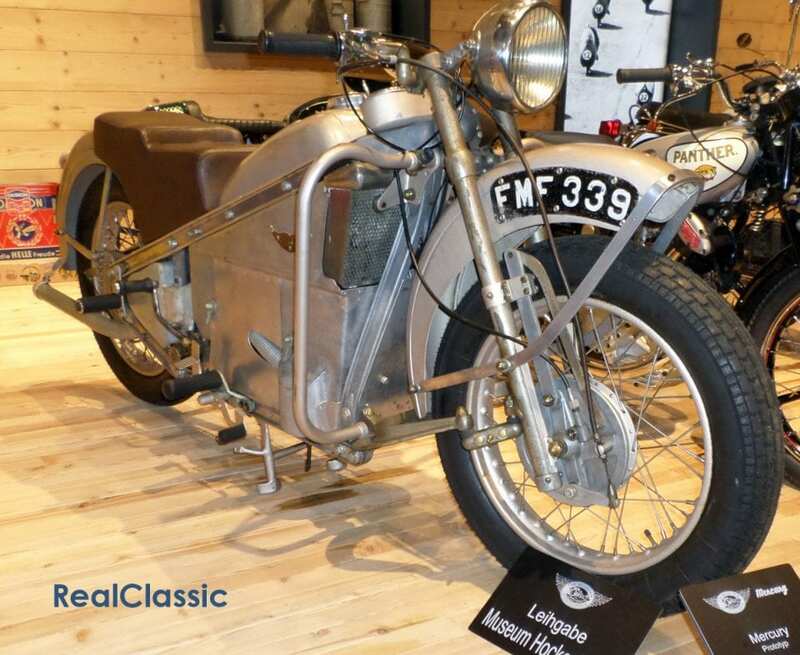 This was an aluminium-framed prototype using a Scott Squirrel power unit, an aluminium body and centre-hub steering. There were three Vincents in the collection, a nicely painted Triton as well as three very tidy BSAs parked up next to a gold Aston Martin DB5. Through the centre of the hall there were pick-up type vehicles with machines from the same nations on the rear beds. 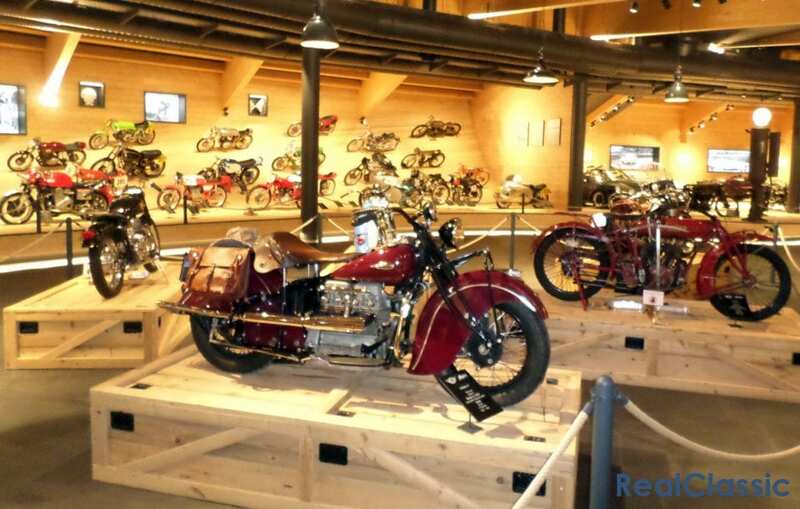 For added entertainment there were audio effect of various motorcycles which sounded as if they were being ridden along the length of the hall in the roof space overhead. I could go on and on and I haven’t even got onto the American machines or the racing section. All in all I would rate the museum as being the second best that I’ve visited; the NMM in Birmingham being the best. 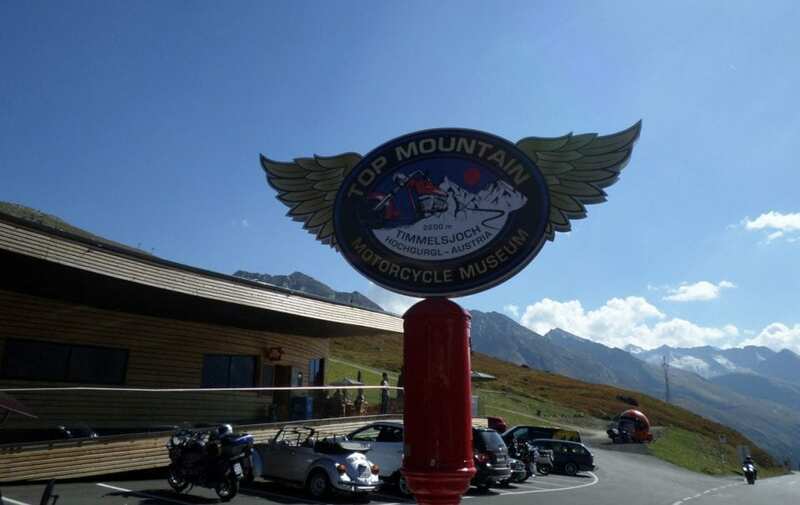 As if the museum had not been enough of an event, there was still the ride back down the other side of the pass, the Passo Rombo as the Italians call it. Wow what a ride. Some say that the Stelvio Pass is the best motorcycling road in the world, and it is a great route. But the Passo Rombo, in my humble opinion, although shorter is tighter and steeper. At one point I looked down to my right, over the guardrail, to see the next four galleries below me laid out as if lined up next to each other dropping away over a distance of about 400 metres. Added into the bargain were overhanging rocks, tight rock arches and over enthusiastic German riders on sports bikes flying up and down. 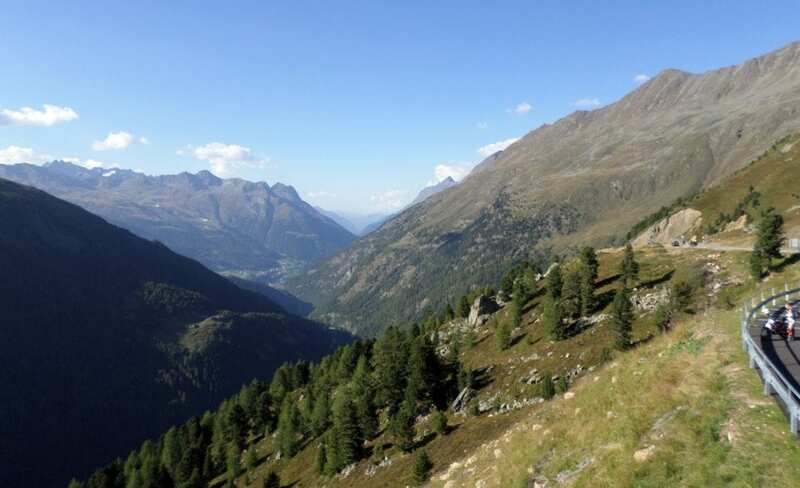 About 30 minutes later we were down to the valley floor and on our way to Merano to our hotel. That evening, after a fine meal and with my second beer, I still could not believe our luck in choosing that route. We’d discovered such a great bike museum and ridden such a demanding road; absolute serendipity in its purest form.